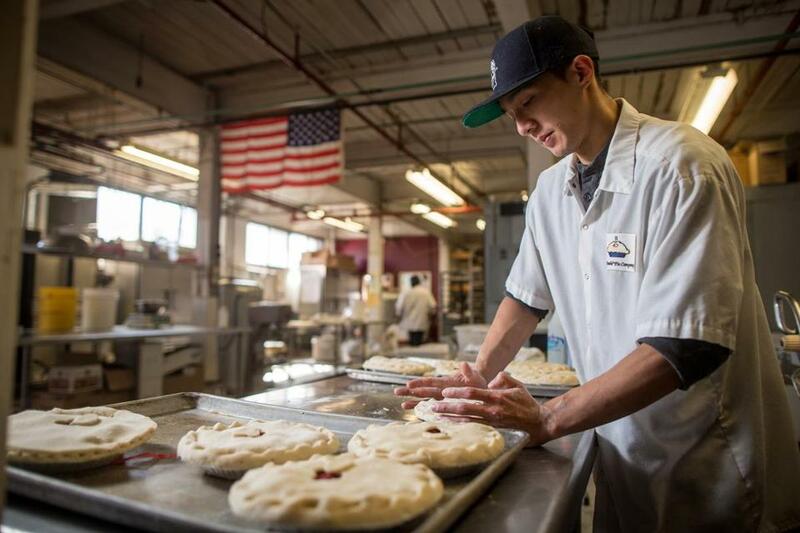 Production crew member Tim Cao crimps pies in the kitchen at Ever So Humble Pie in East Walpole. Above left, a cherry pie. The company does not accept orders, but customers may buy them there. Not long ago, watchers of food trends predicted that pie was the new cupcake, the confection some bakeries have wholly devoted themselves to. And yet pie bakeries have not sprung up everywhere. But that’s hardly surprising, given the precision needed for the art of pie-making. If Thanksgiving’s iconic dessert is too intimidating or time-consuming to attempt, Ever So Humble Pie Company in East Walpole is the answer. The shop sells frozen from-scratch pies made with ingredients from local farms, orchards, and dairies. All that’s left to do is slip the pie in the oven. There are a multitude of flavors ranging from apple to chocolate cream to the trademarked Squmpkin — a blend of blue hubbard and butternut squashes and sugar pumpkins. “We’ll sell thousands, actually thousands, of pies by Thanksgiving,” said owner Andrea Taber. That number is testament to the quality of the pies, and the complications of getting pie just right. Fruit fillings have to be thickened so they’re neither runny nor gelatinous. Dough must remain chilled to become flaky, and handled minimally lest it become tough. Too much water and it toughens, too little and it won’t come together. It can be enough to send someone to the pie shop. Convenience aside, there are also some standout pies. Jumble Berry, her “blue-ribbon winner,” is full of strawberries, wild blueberries, Cape Cod cranberries, and orange. The strawberries retain that fragrance you usually come across only around June, and the cranberries pair with them surprisingly well and offset their sweetness with tartness. Taber explained that the pie got its nickname after a customer passed it off as his own in a contest, but confessed to the judges after winning. He gave Taber the blue ribbon, though she doesn’t know the name of the contest or where it was held. The recipes for orange pineapple and mince pies are solid, yet not flavors I’d gravitate toward again. As Taber said, “Sometimes Auntie Agnes must have mince, but she’s the only one who wants it.” In that case, Taber said, her “cutie pies” are ideal. For blueberry fans, the Black & Blue pie is recommended. The filling of blackberries and blueberries is notably not the jellied goop often seen in store-bought blueberry pies, and gets a little tartness from the blackberries. The Very Berry pie filling — blackberries, raspberries, and strawberries with a dash of cinnamon – resembles a jam, the kind with seeds. Raspberry is the dominating flavor, and it’s reminiscent of those little hand pies filled with jam. All of Ever So Humble’s double-crust fruit pies are vegan, and a special blend of vegetable shortening and canola oil is used. The vegan choice was born out of economy, since Taber could not afford the pricier butter when she started her business. But it opened her up to a new customer base of people with dairy and egg allergies, and she has kept the vegan crust. While it won’t displace butter as my preferred crust, Taber’s crust is flaky with a light texture and good flavor. Other pies like the rhubarb streusel and butter pecan are not vegan, though they’re quite good. The rhubarb is sweet and tart, the oat streusel buttery and sandy. I simply wanted more streusel. The butter pecan has a crunchy surface of nuts that gives way to a sticky filling with a deep, caramelized flavor. The chocolate cream pie is adequate yet falls short of delighting. The Squmpkin’s spices are a little too sharp and pronounced, and the use of low-fat milk instead of cream or half-and-half results in a custard not rich enough. These two, like the pecan pie, get thawed, not baked, by the customer. In addition to pies with crusts there is the apple crisp, which is outrageously good. The local apples are sweet and juicy, baked with a crunchy brown sugar and rolled-oat topping. Except for baked pies sold at farmers markets in the summer, Taber keeps her pies frozen. “If I bake it for you, you’re missing out on one of the best parts of a homemade pie, which is the aroma,” she said. And if she baked the pies first, the clock starts ticking on how long they keep. Ever So Humble does not take orders. Buy pies before the holiday crush, or call ahead to check on stock. The shop is in a building beside the picturesque Neponset River. There is seating inside where baked goods like scones and cookies can be eaten right away. When asked what moved her to open up shop in 2002, Taber, once a nurse, mentioned a childhood love of pie instilled by her mother, also a baker. Shirley Goh can be reached at shirley.goh@globe.com. Follow her blog at whataboutsecondbreakfast.